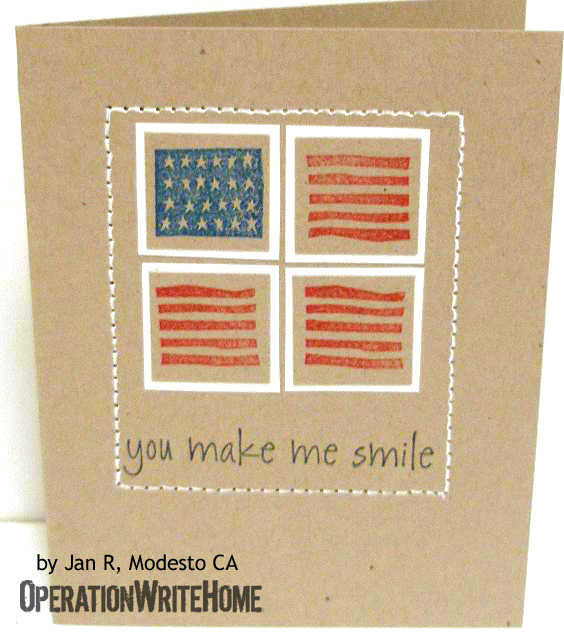 This week's featured cardmaker is Jan....after you check out her cards and story here, be sure to go visit her blog, ArtFriendzy — she has even more work to inspire you! I have been stamping for a little over 15 years. I love all sorts of crafts but stamping is my passion. Do you have a craft room of specific area where you stamp? I do have my own craft room (pic attached). It took me many years to be able to have this wonderful room dedicated to my crafts. We have 5 children so 4 of them needed to move out and be on their own before I could manage to get a room of my own. I love Copic markers, rubber stamps and ribbon. I guess there really isn't anything that I don't like that's associated with stamping. I probably have a little of everything in my stash from over the years. I have loved many different techniques over my years of stamping but the latest technique I use often is stitching on my cards. I just bought a little inexpensive sewing machine that sits on my craft table just for paper crafting. I heard about OWH on one of the blogs that I stumbled across in my blog surfing. My daughter is in the Army and I began sending her cards when she left for boot camp in 2008. Once her friends saw the cards and the connection to home they all wanted one. 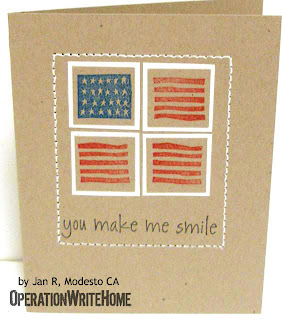 I mailed many, many cards to soldiers in the U.S. and after seeing the impact it had on them I knew I needed to become involved in OWH for our soldiers who are overseas. I want our soldiers to know that we are thinking of them and praising their service, and OWH is one way to show our support. My daughter is serving in Germany and I keep her supplied with a stash of homemade cards for her personal use. Nice to meet you Jan! 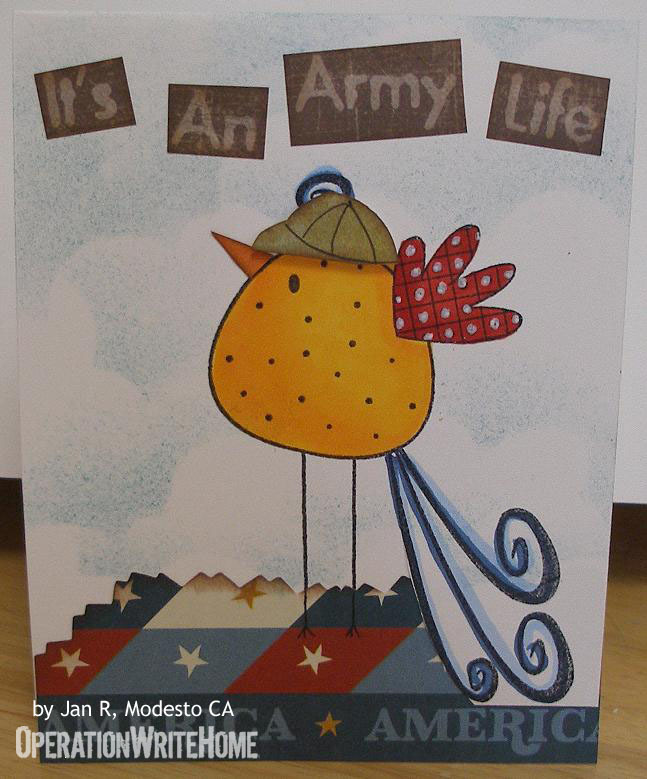 I love your cards, especially the one that says "It's an army life!" Wow, what great cards. That is my dream craft room. Thanks for letting us get to know you. I love what you've done with the top note die, so cute! And your craft room is to die for ;), nice to meet you today, I can't wait to visit your blog. 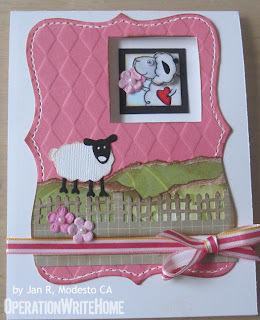 Wow~ Beautiful cards and inspiring story. I like your techniques that you used in your cards. Thanks for sharing. I love all of the cards shown here, your room is also fantastic. 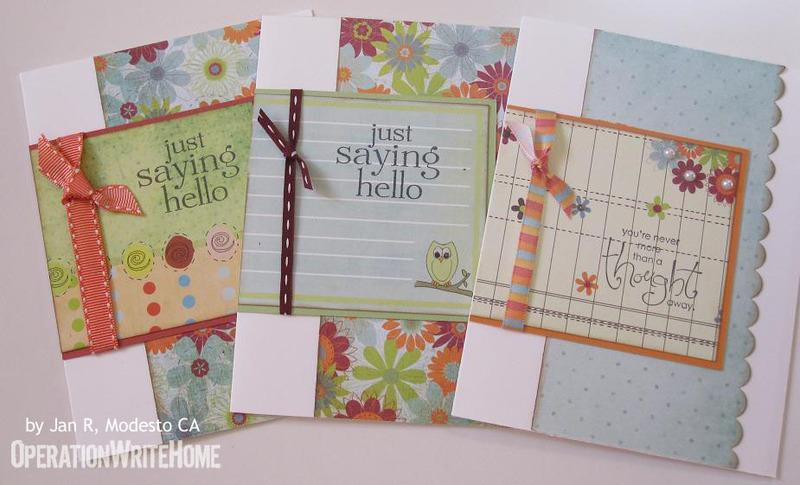 Hi Jan, it's so nice to meet you as the featured stamper this week! 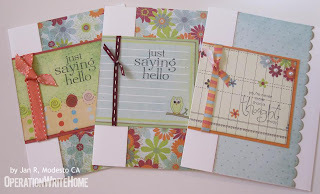 I see you like (and use) the top note die as often as I do :) Your cards are beautiful with all the embossed texture and great colors and I'm drooling over that fabulous, well-organized craft room of yours!! Your a Wonderful stamper Jan...congrats on being recognized here....You rock!! What fantastic cards Jan. They are all so beautiful. The details really make these special. Someone with your talent most definitely *needs* a dedicated craft room, I am glad you have one. Thanks for sharing your cards and introducing yourself to all of us. I want to move into your craft room!!!! LOVE your cards! You are a talented lady! I am also SOOOO jealous of your craftroom! Very nice space. Your cards are gorgeous and I too am "in waiting" for a child (18) to move out to get a guest/CRAFT room...is this bad of me? lol But as I wait I have a craft "nook" underneath my sons(8) loft bed! I just set up my sewing machine in his room too so i can try card stitching -you're an inspiration! 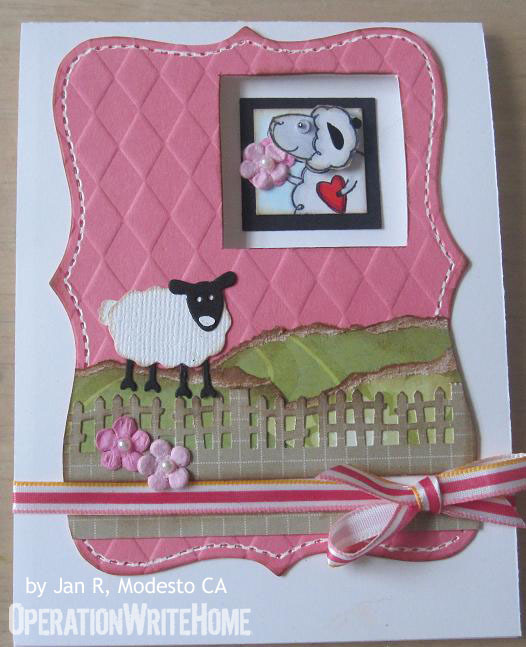 Great cards...fabulous craft room...thanks for sharing. Jan's cards are always awesome. Congratulations on being recognized here.